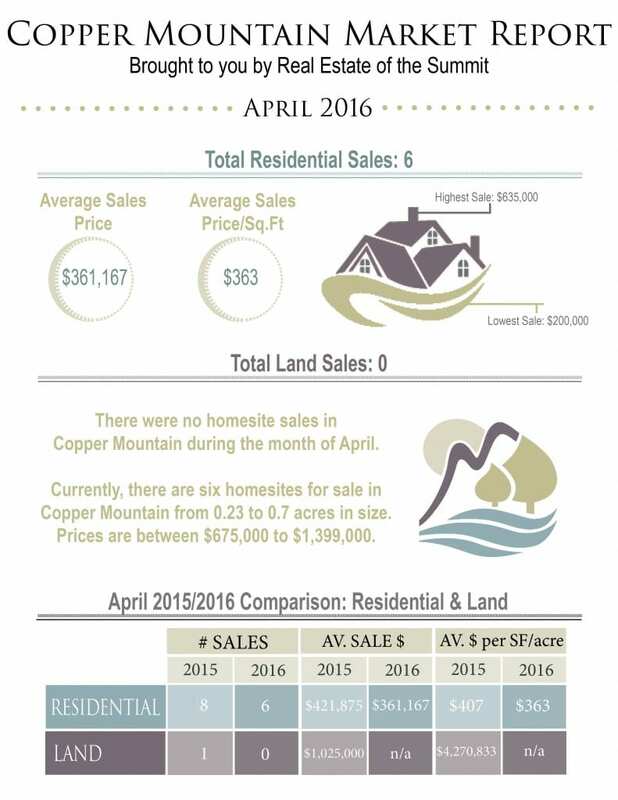 The Copper Mountain Market Report is brought to you each month by the professional team of brokers at Real Estate of the Summit! The monthly visualization details monthly sales, average sale prices and year to date comparisons. Our team is dedicated to analyzing significant market changes and trends each day so that you can make an informed decision on your next real estate investment! Copper Mountain, Colorado is a beautiful destination for skiing, mountain biking, fly fishing and more! Many of the hot real estate properties in Copper feature ski-in/ski-out access. This location is ideal for someone who wants to be near the hustle-bustle, but enjoys peace and quiet. Make an informed decision next time you consider purchasing or divesting in Summit County properties, by staying on top of the trends with our Copper Market Report featured below! Take a look at the Copper Market Analysis page, which contains market information from previous months and will help you to compare past reports – you can find a link to this page below. For even more information about what’s going on in Copper feel free to contact one of our knowledgeable brokers at Real Estate of the Summit by calling our office at (970)453-1450.